Get a feel for our training before you buy the full package by completing an intro lesson. We will meet private for 1 hour and discuss issues you are facing and what training will help you accomplish the results you are looking for. Our Basic Obedience Package will give you everything you need to have your dog loose leash, and accomplishing 4 commands. The commands include COME / SIT / OFF / DOWN / PLACE / HEEL (loose leash walking). We will meet 1 a week for a 1 hour private session until completion. 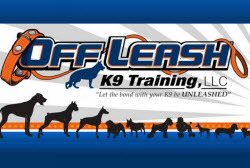 This package includes the basic obedience package plus 4 additional lessons. Our therapy dog development course is 8 private lessons, the e-collar, and a 15ft leash. This course prepares you and your dog to meet the requirements of therapy dog testing and certification, through basic obedience and scenario-based practice. Bring All-American K9 Training to you with in-home training. This package includes 4 one hour lessons in your home. 4 – 1 hour private sessions for your puppy. For dogs ages 5 months and below. This will give your new pup a good foundation for basic obedience! We will start basic obedience (come, sit, down) and teach you how to house train your dog. We will also cover unwanted behaviors and answer any questions you have regarding your new pup. The 2-week board & train program takes the leg work out of the training for you. Drop your dog off for 2 weeks at camp so he/she can learn the 4 basic lessons with distraction work . By the time you come back to pick your dog up, he/she will be flawless with all of these commands, off leash, with distractions! The 1-week board & train program takes the leg work out of the training for you. Drop your dog off for 1 week at camp so he/she can learn the 4 basic lessons. By the time you come back to pick your dog up, he/she will be able to perform 4 basic commands!